I just can't help myself, their little pouty faces are so cute! They're even cute when they're upset. Don't worry, I put the camera down right after snapping these and made those little pouts go away. I'm doing a vlog today. A couple of sweet bloggers, Chamel and Brittney, awarded me with the Liebster blogger award! The Liebster award is intended for blogs with under 200 followers, but I totally think I still qualify, because (1) at the time of receiving the award I had less than 200 followers on Bloglovin, and (2) I have less than 200 followers on Twitter. So I qualify. And I'll probably use the same rules when I pass the award back out. Part of the award is answering a list of questions from the person who gave it to you, and I thought it would be fun to do a vlog for the questions! So that's what I did. 1. I'm talking really fast and probably didn't explain myself the best because I was trying REALLY hard to keep this video under five minutes . . . and I failed. But only by a minute. Forgive how rushed this feels. 2. I was debating straightening my hair before the blog, but decided to forget it. There is one little curl that is sticking out from my head and it's driving me nuts. Oh well. 3. I really didn't take a lot of time to think through all my answers for this, so you get the improv version of me - ha! Which is probably more fun and conversational anyway. Because most people don't rehearse their conversations before they have them. 4. All those loud hammering noises are from Derek hammering nails outside the window. He's fixing our porch because it was rotting away, and it's become a huge project. 5. Here are the questions I'm answering in the vlog, along with their corresponding start points in the video - that way you can skip to the questions that most interest you. Please take advantage of this information and skip over my rambling to your heart's content! It won't hurt my feelings. The questions for today are from Chamel, and they were good ones! Another blog with the questions from Brittney coming soon! AwardVlog1 from Callie on Vimeo. I wanted to read Rosemary Cottage by Colleen Coble because I read another one of her books, Tidewater Inn, last year and I enjoyed it. When I started this book I realized that it is the second book in the series and actually includes some of the same characters that appeared in Tidewater Inn, so that made it even more fun for me to read! I like it when authors give us a glimpse into how their previous characters are doing, and this book did that. Amy is convinced that her brother's death was not an accident, and she's going to prove it. She heads to Rosemary Cottage, their childhood vacation home, and the place he was staying when he died. While she's there she runs into Curtis, who has also recently lost his sister and is taking care of the child she left behind. Suspicious things happen that make them both realize that there is more to their siblings deaths than they originally thought. Coble's books are written in a more relaxing and laid-back way than other mysteries I have read, which I think makes them perfect to read on vacation. At times I felt like the "flow" of the book was a little disjointed - I felt like certain things could have been explained more naturally and clearly. But I liked the characters, and I really enjoy the pictures that Coble paints in her books - I can imagine myself on the Outer Banks when I read them. I also felt like Coble did a good job of balancing the grief that the characters were feeling. If I lost one of my siblings I would be devastated, and Coble dealt with her characters feelings instead of glossing over them (which I think happens sometimes in novels), but she did it without it seeming too depressing. This book actually surprised me because there were a couple of interesting plot elements, including a twist at the end, that I was not expecting! I enjoyed it, and I would recommend it. As part of the book tour, Coble is also hosting a Facebook giveaway and today is the last day to enter! She'll announce the winners on Monday, so click here for more information and to enter! Note: I received this book for free from Litfuse Publicity in exchange for this review. This is my honest opinion. Since we got back from vacation, the thing that has been weighing on my mind is that I don't have much time before Derek starts traveling for his work again. It's been a year sine he got this job. I feel like going into it I was so naive - I thought it wouldn't be too bad when he was traveling, that we'd have plenty of time to talk in the evenings and when he was home on the weekends, and then his months of working from home would be this great time of getting to spend more time together than we would get to in any other job. In reality it's a lot different. I miss him like crazy when he's not here, and by the time we get to talk on the phone in the evening I'm usually in the middle of getting the kids ready for bed and I'm exhausted. He usually has extra work or studying to do in the evenings when he's on the road, so we simply can't spend as much time talking and catching up on our days as I would like. Then when he comes home on the weekend it's this mad dash to squeeze as much quality time together as we can in between all our other obligations, and it's hard to really feel connected when you are rushed. The months when he's been home have not been how I expected at all. I don't think I thought about the fact that even though he's working from home, I have to still act like he's not here for eight hours during the day. It's been a struggle for me to learn that I need to let him get work done, and any interruptions are just going to cause him to have to work later in the evening. Complicating matters is that just when I think I'm getting it down, it switches on me. He spends three months on the road, three months at home. I don't have enough time to really get good at learning how to handle everything when he's gone. I don't have enough time to learn how to balance the day when he's working from home. I'm not saying all this to complain so much as just to explain that this year has been hard for me. Before Derek got this job we both prayed about it, and it seemed like this is where the Lord wanted us to be. But then it was so different from what I thought. I'd be lying if I said that I don't wonder sometimes if we misunderstood God's will, because why would He put us through this season of demanding work schedules and time apart when He knew it was going to be so hard on me? But then, nowhere does it say that if you follow God's will everything will be easy. In fact, the Bible says just the opposite. We are guaranteed trouble in life, which is why I'm glad this isn't all there is. 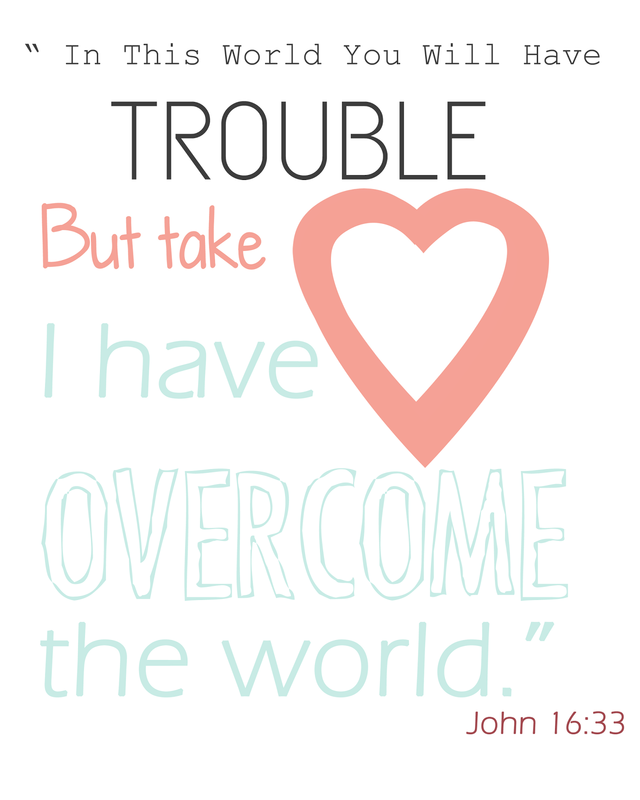 I've been studying James lately, and James talks a lot about trials. As I was reading I realized this situation, with Derek being away so much, is a small trial in my life right now. It's also a trial I would much prefer to the alternative trial of having him be out of a job, so in reality I should be thankful! It has been a struggle, but I can choose to complain and gripe about how rotten it is and how much I hate having him gone, or I can take this as a chance to let God grow me. I can practice being supportive, find ways to show Derek I'm proud of him and the work he does, think of special things that kids and I can do for him when he gets home. I can practice encouraging him, I can pray for him while we're apart. I can use the extra time I have when he's away to think of ways I can be a better wife and mother, and I can do them. I can be a blessing to my family through this time, or I can make everything harder with my attitude. I so want to choose the better path and be a blessing. But I'm definitely not there yet. I feel like I'm constantly failing in my attitudes and actions in this season. But with every failing I think I've been recognizing it more and more for what it is, and I have more of a desire to change, to do better. And change only comes through God's help. For the first time I think I can see a glimpse of what God is trying to do. I think He's trying to refine me. Now that I can see it, it's becoming easier for me to let go of my white-knuckle hold on how I want my life to be and let Him do His work. I had plans to to work on some blog stuff and take a bath yesterday while the kids napped. I got Wyatt settled and then settled down to give Gwen a bottle before putting her in her crib. She was a little fussy, so I turned her over to burp her, and she did something she never does. She snuggled against me and promptly fell asleep, her little hand resting on my chin. I had so much I wanted to get done, but I could't bear to move her. It's rare enough to have her fall asleep in my arms, but I know she's on the downward slope. It's only a matter of time before she never falls asleep withme again. I've got some time I think, but you never know when they are just going to stop. They grow up when you aren't looking. So I sat there. I looked at her little feet, crossed at the ankles. I looked at her tiny, perfect fans of eyelashes. I tried not to move so she wouldn't take her hand off my chin. I noticed her sweet little breath blowing against my face. Her hand finally dropped, and I sat there, her warm little body snuggled up against my side. I watched a couple reruns of Family Matters and Say Yes To The Dress. I just wasted an hour. It was time well wasted. Before long she stirred. She opened her eyes and reached out her tiny fingers and started to play with my wedding ring. She started to get squirmy, so I put her down in her crib so she could still get her full nap. I had other posts I was going to share today, but this seemed more important. It seemed like the better thing to do to record all the details of this small, sweet moment. When I'm 40-something, and my Ruby Girl is headed off into the world, I'll think back on moments like this. And I might cry, but I'll be happy too. Because the memories are a gift. For now, this was just a good reminder to slow down. To take time to notice the details. What perfect presents from God these little lives are. The next linkup will be on August 7th and the theme will be . . . So get someone else to take a picture of you with your kiddo this time! You can wear outfits that go together or not, up to you, just post a picture with you in it too! Now it's your turn! Link up your "Under $25" outfits below! Here's a quick recap of the rules. 1. Every other week we'll have a different outfit/style theme, so just post something related to kids' clothes within the theme. 2. We'll be hosting the link-up bi-weekly, and we will announce the theme ahead of time so you have a week or two to snap some pictures or search out some cute clothes that fit the theme! 3. 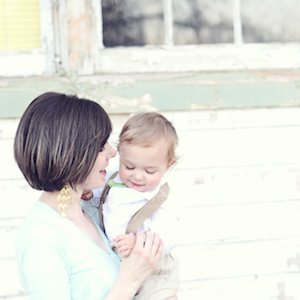 Please follow Allison and me, either through GFC, Bloglovin, or on Twitter. 4. Please link back to either Allison or me in your post, or grab the link-up button for your post or sidebar! Highlight text and press CTRL-C to copy. 5. 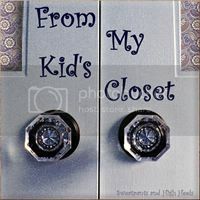 If you want to participate on Twitter or Instagram, just include the hashtag #frommykidscloset. 6. Keep post content G-rated. This is a kids' style link-up. We will remove any links that we deem inappropriate. Knowing you all, I doubt this will be a problem, but we have to say it! Welcome back for another week of From My Kid's Closet! The theme this week is "Under $25 Dollars", meaning the whole outfit total has to come to under $25. Incidentally, Wyatt and Gwen's less-than-25-bucks outfits also coordinated! I actually did not plan this, but it worked out nicely, right? Shirt - Four bucks on clearance at Target. Shorts - Four bucks at the thrift store (score!). Shoes - Sixteen bucks at Target. The most expensive part of his outfit. Trust me, if I could have gotten Wyatt sturdy sandals for cheaper, I would have. Train - Not part of the outfit, so it doesn't count, but it just appeared in my house one day . . . I suspect Wyatt may have accidentally smuggled it out of Sunday School, because I've been finding things in his pockets lately. But I can't be certain. Shirt and bloomer outfit - I actually did not buy this myself, but I've seen very similar outfits at Target, so I'm guessing it cost around $15. Barefoot sandals (which elicit "oohs and aahs" from all ladies in our general vicinity wherever we go) - Five dollars from this Etsy seller. I got them on sale. Headband - Three dollars from this Etsy seller. They have a ton of colors too. Pretty cute, right? I'm sure you could do kids' outfits for cheaper than this if you tried, but I was pretty happy with what I came up with! I'm separating out my post from the link-up post this week, so scroll up to the most recent post to link up! They crack me up sometimes. They both looked so blonde in these pictures! I think Gwen's hair is getting lighter, and Wyatt's is getting darker. We had a good time swimming with Ashley this past week! Gwen wasn't a big fan of the water, but Wyatt had fun! It's the post you've all been waiting for - the one about camping with kids two years old and under! Get ready, because it's going to be a long one. So this vacation had an unusual start. The weekend before we left on vacation we went on a little trip to my grandma's house with my parents and siblings, and we left Harvey at my parent's house because they have a nice breezeway where they could keep Harvey for us. When we got back, Harvey had destroyed the gate that was keeping him in the breezeway, and he broke through one of my parent's window screens and chewed up their custom blinds to get into their house! Turns out there was a thunderstorm while we were gone, and he's terrified of thunder. All the repairs kind of cut into our vacation budget, so our plans for our week-long camping trip went out the window. I was pretty disappointed, but we made plans to go spend another couple days with my grandma and then camp a couple nights and then come home. Unfortunately I had been feeling weird all week, and the day before we left I figured out that I had Shingles. Shingles! I thought I was too young for Shingles, but apparently not. It started out with weird shooting pains in my ear area, then developed into painful swollen lymph nodes and a tingling scalp, and then on the day before we left I finally developed an itchy/painful rash. It was pretty awful. My doctor told me I'd probably have a mild case since I was so young, but if that was a mild case I'd hate to have a severe case! It hurt! I had to use calamine lotion for the itch (which made my hair all greasy because it was mostly all through my scalp) and I stayed on my tylenol and anti-virals the whole time. Thankfully after the first couple days I started to feel alot better, but it made for a stressful start to our trip. But no way was I going to cancel, so on July 4th we left for my grandma's house! We stopped in the town where she lives and walked around a carnival and got ice cream first. The petting zoo - Wyatt loved it! Out for ice cream! I got a chocolate soda float, and it was really good! Later at my grandma's house in our patriotic garb for the 4th of July! The next day we kind of just hung around my grandma's house, and then we went into town for dinner that night. We wanted to take Wyatt to splash in the river, but the weather ended up being a little rainy, so we just walked by the water instead. My grandparent's with Wyatt and Gwen! We had such a nice time visiting with them. The plan was to go camping the next couple of nights, but last minute we decided to change our destination and go to the Grand Canyon! It turns out the weather in Arizona was going to be a little cooler over the next few days as well, so we didn't even have to worry too much about the kids getting overheated. We made the long drive there and made it just in time to set up our tent before dark. We camped in a nice KOA campground! I was a little nervous about our first night in a tent and whether Wyatt would like it or not, but he loved it! Gwen, on the other hand, was up 2-3 times during the night, but she was that way at my grandma's house too, so I think it was just because she wasn't in her own bed. In the early morning I just snuggled Gwen under the sleeping bag with me, and when we woke up Wyatt and Derek were gone - they came back a little later with donuts! It was refreshing, waking up to the nice outdoor air, and it reminded me of the summer I was a counselor in teepee camp. I decided then and there that I really liked tent camping! I hope to go again next year. Happy girl, all snuggled under the covers! Happy boy, with his donuts! The plan for the day was to drive to the Grand Canyon! We got there and walked around the visitor center first. It was gorgeous! It's been a long time since I've been there, and it really was amazing to look out at this vast canyon. Looking at something like that just always reminds me of how much bigger and more awesome God is than anything He's created! I'm glad I serve a God who can do that. It's amazing. We wanted to drive around to the north rim, but when we figured out how far it was we realized we probably wouldn't have time because we wanted to see if we could drive up and see Antelope Canyon while we were in Arizona. But then we found out that the road to Page (where Antelope Canyon is) was closed! I'm wondering now if it was a fire or something? It would have taken us another couple hours to take the detour, and honestly, we felt bad keeping the kids in the car for so long. So we decided to just head back and hang out at the campground the rest of the afternoon. I was bummed we didn't get to see Antelope Canyon, but we made the right decision. Maybe next time! I got so much reading done on this trip! I think I read 5 books cover-to-cover, minus a couple chapters that I started before we left. It felt good! We had fun just lounging around in the tent! Derek made us hot dogs and beans for dinner! Wyatt played with his bubbles while Derek heated up our food. Gwen fell asleep in the tent - she was pretty cozy in there. Wyatt talking on his "phone". He was having a very serious conversation. We did realize that we were right next to Route 66, so of course we had to take a drive! Yes, we took pictures next to an auto park sign. It was the best Route 66 sign available. I thought it was fun to drive and see all the motels, but it was a little sad too. I've decided if I ruled the world, I would make all the businesses along Route 66 retro-1950's-themed to make it a fun touristy attraction. There were some buildings left that still had a 50's flair, but I think it would be fun if they were all more over-the-top! In the evenings when we camped we all snuggled in the tents and watched movies on the laptop (I know, we were really roughing it). The first night we just watched some of Wyatt's Veggie Tales show, and the second night we watched Marley and Me and ate chocolate. It was fun to have our own little movie night! All snuggled in the tent the next morning! Unfortunately this still had to be a short trip because of the whole Harvey-chewing-up-our-budget issue, so we had to pack up our tent site and head out. The drive that day was a little nerve-wracking too, because our power-steering fluid decided to leak! I'm glad I have Derek around, because I would have had no idea what to do. If we had known we were going to drive so far we would have gotten a tune-up for the car before we left. We didn't break down though, and we did stop by Four Corners! We had to wake the kids up from their nap to see it, so they were both really grouchy and hated the wind and the sun. I didn't even pay attention to where I was standing when it was our turn to take a picture, and only later did I realize that we weren't in the exact middle! Rats. Wyatt and me are in Colorado and Derek and Gwen are in New Mexico. At one point Wyatt and me were in New Mexico and Derek and Gwen were in Arizona, and vice versa. I don't think any of us made it to Utah. The plan was to camp one more night on the way home, but when we finally got to the place we were planning to camp we were all too exhausted to bother setting up a tent and decided to go to a hotel. That ended up being mistake though, because Wyatt hated it! I think he kept thinking we were going to leave him alone in the hotel room or something, so we didn't get to do too much. Looking back, we should have just camped after all. Oh well! I'm actually glad we didn't go for a whole week. I think five nights was about the limit for the kids. We also stopped by Focus On The Family as part of our vacation! We missed the last tour for the administrative buildings, but it was worth the trip even without the tour. The downstairs is entirely for the kids, and it is amazing! They have all kinds of stuff to play with, plus a soda shop. Of course, my favorite was the bookstore. I could spend way too much money there if I let myself. We escaped with a new movie for Wyatt, more Arch books for Wyatt and Gwen, and a marriage book which we're both looking forward to reading. We're just going to budget to send Harvey to doggy camp next time we go somewhere. "ABC's of God Loves Me" Review and Giveaway! "The Blessings Jar" Review and Giveaway!